This is an extended version of an article that appeared in the May/June 2014 issue of Dimensions magazine. Many people think that cities, especially ones as large and stereotyped as Los Angeles, are devoid of nature, and certainly devoid of any nature worth studying. Scientists at the Natural History Museum of Los Angeles County (NHM) think otherwise. “We are just as likely to find a new species of insect in Los Angeles as in the forests of Costa Rica and Brazil—that is, 100%,” said Brian Brown, NHM entomology curator. In fact, Los Angeles is located in a biodiversity hotspot, one of 34 scientifically recognized places on Earth that are home to an incredibly high level of biodiversity and that suffer high threat from human actions. Unfortunately, not all urban residents feel comfortable in nature, let alone equipped to collect data on lizards, ladybugs, bees, or dare we mention snakes—something museum educators and evaluator Heidi Ballard discovered while observing visitors participating in citizen science activities. In an effort to facilitate positive first experiences in nature, NHM educators designed programs that gradually introduced nature to those unfamiliar with it. For instance, before inviting visitors to survey insects in the museum’s new 3½-acre Nature Gardens, educators slowly acclimated participants to their surroundings—the plants and wildlife—allowing time for wonder and discovery. They found it much easier to teach visitors how to collect insect specimens (especially those of the stinging variety) after creating positive experiences with those creatures and their habitat. Citizen science programming at NHM is supported in part by Time Warner Cable. Recent interest in alternative sources of energy inspired the Saint Louis Science Center and the Donald Danforth Plant Science Center in St. Louis, Missouri, to collaborate on Backyard Biofuels. Funded by the (U.S.) Department of Energy and National Science Foundation (IOS-0701919), the project brought public attention to the significance of algae in biofuels production. Combining the science center’s reach to over 900,000 visitors yearly with the Danforth Center’s scientific expertise, a unique opportunity was created, enabling the general public to participate in biofuels research by contributing algae samples found in their homes, backyards, and communities. In 2010 and 2011, staff distributed more than 2,000 kits containing materials and instructions for collecting algae, along with data sheets for recording collection site information. Over 400 algae samples were collected throughout the St. Louis metropolitan area; a few came from as far as New Hampshire and Alaska. Science center staff cultured the algae samples and sent the ones that grew successfully to the Danforth Center for lipid analysis and DNA sequencing. Participants kept track of their samples online throughout the study. From samples submitted, 10 species were identified as good oil producers and are currently being used in intensive biofuels research. The success of Backyard Biofuels was two-fold—not only did it educate the public about algae, biofuels, and renewable energy, but it also enabled the public to make significant scientific contributions. One participant stated, “Our region, and indeed, our nation, needs more projects such as Backyard Biofuels if we want more young people to become interested in science and technology to help solve the challenges facing our global community in the 21st century and beyond.” Indeed, the project’s success serves as an inspiration to scientists and educators to recruit the public in scientific pursuits and encourage in them a lifelong passion for scientific discovery. Teaching science, technology, engineering, and math (STEM) skills to kids is not a new idea; the current challenge is finding ways to integrate the four discrete disciplines. Chabot Space & Science Center in Oakland, California, in partnership with Professor Ronald C. Cohen’s atmospheric research laboratory at the University of California, Berkeley, has embraced this challenge by immersing students and teachers in real-world, problem-based learning at the boundaries of these four disciplines, where they naturally overlap. The Berkeley Atmospheric CO2 Observation Network (BeACON) seeks to identify sources of pollution at the same scale that most people see every day; that is, at the neighborhood scale rather than citywide. By placing observations in neighborhoods, Cohen hopes to inspire members of the community to take action to change the CO2 they emit. Scientists have installed “sensors in a box,” or nodes, in more than 20 locations around the San Francisco Bay area—many of them on school buildings. Students and teachers get firsthand experience hosting a node and designing experiments using data from their own sites and other locations, as well as data they collect with handheld weather meters, CO2 sensors, and global positioning system (GPS) units that Chabot lends to participating teachers. The project aims to provide students with tools and resources to think critically about the data they collect at their schools and neighborhoods and the results they communicate to the community. Teachers are supported throughout the program through professional development workshops and forums hosted at Chabot. Chabot also connects students and teachers with the project scientists, who work alongside them in near-real time to collect and interpret data. Connecting students and teachers to science role models also gives scientists valuable experience communicating complex science research to the public, a skill commonly overlooked in academia. The program culminates in scientists’ visits to participating schools as well as a student field trip to university laboratories led by the graduate researchers themselves. Held in August each year, National Science Week is Australia’s largest festival, with 1.5 million people attending more than 1,800 events that are contributed by organizations from all over the country. An important component of the week each year is a national online citizen science project coordinated by the science unit at the Australian Broadcasting Corporation, Australia’s public broadcaster. Last year, the project was Explore the Seafloor, where members of the public were asked to identify kelp or sea urchins in images taken by autonomous underwater vehicles. More than 300,000 images from around Australia’s coastline were processed by 9,300 people. This work is usually done by research assistants and is both laborious and expensive. The images are used by researchers to determine the health and migration of kelp beds and also to monitor urchin population explosions. Establishing a community of practice. The three-year initiative started with a planning workshop that focused on refining the parameters of the monitoring project, logistics, and protocol. Participants included personnel from Boston’s New England Aquarium (lead project partner, principal investigator, project director, instructors, and scientists); leads at partnering science center camps at 12 coastal sites from Connecticut to Maine; and a representative from the Census of Marine Life (COML). Contributing to the Ocean Biogeographic Information System (OBIS). Science advisor Tom Trott, a COML researcher and associate professor at Suffolk University, provided oversight to partner-scientists at each camp to ensure that COML’s Natural Geography in Shore Areas (NaGISA) near-shore biomonitoring protocol was followed. Data from at least one field day per year, per camp were provided to OBIS as part of a 10-year study to measure biodiversity in the ocean. Increasing ocean literacy among campers. Robust training—pre-, during, and postfield monitoring—provided context for participating youth. External evaluation found that participants’ ocean literacy improved and that they felt empowered and proud of contributing to a real science project. Supporting peer-to-peer exchange of information. Participants had opportunities to present their experiences to their peers at regional meetings (NEOSEC’s Ocean Literacy Summit, National Marine Educators Association Chapter conferences, and regional ocean science meetings). Camps also received funding to bring participating teens to a Fall Teen Ocean Summit, designed in collaboration with the teens themselves, including an experience similar to a scientific poster session. The team will be building upon these successes in the follow-up project Summer on the Marsh, engaging younger camp kids in salt marsh exploration and citizen science data collection over the next two years. Wellington Zoo’s Bush Builders program is reconnecting urban children to local wildlife, encouraging hands-on exploration while promoting change in environmental behavior. Launched in 2007, Bush Builders enables students to participate in active conservation, interact with scientists through weekly hands-on workshops, and become stewards of their environment. The Community Trust of Wellington provided start-up funding for the first year. At the beginning of the program, students conduct baseline surveys of their local habitat via transects, pit traps, and quadrants. In addition, zoo staff assesses their knowledge and attitudes about the local environment. Later, in partnership with Wellington City Council, students quantify their local environment and conduct habitat restoration and planting around their schools to increase native flora and fauna. At the conclusion of the program, students monitor the change in nature around their school and their attitudes and beliefs are reassessed. In the inaugural year, data were collected from over 800 children, and results indicated student awareness and appreciation of local flora and fauna increased dramatically. Bush Builders allows students in an urban environment to participate in active conservation, interact with scientists, and take ownership of their environment. New Zealand’s Department of Conservation recognized the program’s goals and successes with the 2008 Advocacy and Education award for the Wellington Conservancy. In the millennial era, it is only safe to assume that technology has become ingrained in the everyday lives of students; thus educators are learning to react and adapt their classroom and research questions to embrace technology. I have been encouraging students to become “citizen sensors,” to engage in research projects that are collaborative, long term, and large scale with their mobile devices. The Epicollect app project RoadkillGarneau enables users to log roadkill using their smartphones and tablets in order to assess regional movement patterns of wildlife. Users upload photos of roadkill along with data such as location, time of day, species, and the road’s speed limit. This information can be shared with wildlife conservation professionals and state transportation workers. The latter can implement changes—including establishing fencing, increasing wildlife crossing signage, or reducing speed limits—to save lives of both humans and wildlife. So far, the roadkill project has logged at least 520 individuals from 53 unique species in 19 U.S. states. Raccoon, striped skunk, and gray squirrel top the list of roadkill animals overall, as well as in northeastern U.S. regional data. Armadillo was the most commonly logged roadkill in Florida, while in Michigan, deer was logged most often. Researchers in Austria have translated the app into German and embedded their BOKURoadkill project in a course of more than 300 students for an international collaboration. The University of Colorado Museum of Natural History, Boulder, has recently initiated several successful citizen science projects. Two of these projects in particular—Notes from Nature and The Bees’ Needs—highlight the ability of even small museums to use volunteers to implement very different kinds of citizen science research. Notes from Nature takes place entirely online. It engages more than 5,000 volunteers in digitizing biological collections housed in natural history museums worldwide. Notes from Nature crowdsources labor-intensive tasks that are critical to keeping museum collections accessible and relevant. This project does not explicitly address any single research question nor does it have an immediate educational outcome. It does, however, provide a much needed introduction to museum collections, including their variety, complexity, detail, and perhaps most importantly, their relevance in an era of accelerating biodiversity loss. Another one of the museum’s citizen science initiatives, the Bees’ Needs, is a field-based research project that takes place exclusively in the Northern Front Range of Colorado. It relies on a volunteer workforce of about 500 people and is focused on answering a very explicit research question: How do landscape attributes and land management practices influence native solitary bee and wasp diversity and abundance? To answer this question, the museum provides volunteers with native bee nesting sites on which they collect data every other week throughout the summer months. This project openly seeks to educate and engage volunteers around scientific literacy and conservation biology of native insects. The Bees’ Needs has brought the research of the museum’s entomology staff across the state and engages volunteers in a personal way. Project staff communicates with volunteers via weekly email updates and frequent blog postings, and volunteers engage with each other by sharing photos of and comments about their observations and experiences online and in person at various volunteer thank you events. In summary, these two projects differ significantly in terms of scale, intention, and volunteer motivation. However, both projects allow the museum to stretch its influence significantly beyond its walls. The mission of the California Academy of Sciences, San Francisco, is to explore, explain, and sustain life. Its museum floor engages the public about the science of the natural world around them, while its researchers document biodiversity and discover new species in hotspots around the globe. The Academy’s citizen science program combines science learning with research, developing a community of naturalists of all ages while providing scientists and partners with valuable data they require to better understand and conserve biodiversity. Through its citizen science projects, the Academy empowers the public to do the same type of research as Academy scientists, engages communities to answer real research questions, and connects people to biodiversity all around them. A key to this success has been utilizing the power of partnerships and providing multiple paths to involve participants in citizen science programs: in the field with scientists, through digital technology, on the museum floor, and through the Academy’s youth programs. In one facet of the Academy’s biodiversity citizen science program, volunteers undertake focused surveys in unique California locations to build a comprehensive biodiversity baseline. This baseline allows researchers to better monitor change in the future and can be compared with the Academy’s historic collections to help understand changes that have already taken place. This program also promotes science literacy and stewardship, as volunteering increases the understanding of the importance of biodiversity and its contribution to the health and resiliency of ecosystems, while also deepening ties to local environments. In addition, the Academy is partnering with iNaturalist to build a global network of citizen scientists, researchers, and land stewards working together to tackle pressing global biodiversity and conservation challenges. The Academy is encouraging people to document the organisms around them, to help answer research questions, and to come together and participate in “bioblitzes” of local parks and open spaces—all with a curious eye and their smartphones. Stay tuned as well for an iNaturalist app to enable people everywhere to resurvey historical museum specimens. 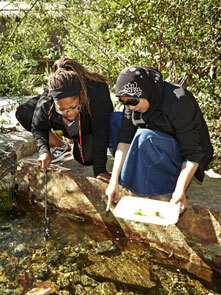 The Academy also uses citizen science to engage middle and high school youth in authentic science experiences. The Careers in Science Intern program, which targets middle and high school youth traditionally underrepresented in the sciences, has been contributing to the National Marine Sanctuaries Long-term Monitoring Program and Experiential Training for Students (LiMPETS) since 1996. LiMPETS surveys 33 species in the rocky intertidal zone and focuses on the Pacific sand crab in the sandy beach intertidal zone. The LiMPETS data, all collected by middle school, high school, and college students, have been used to influence coastal monitoring policies in California. The Academy’s high school interns are the longest consistent contributors to the project and have developed research questions to analyze using the LiMPETS dataset. The youth present their work in a poster session at the American Geophysical Union’s annual conference. Using citizen science data sets to investigate interest-driven questions is an empowering experience, and one interns frequently cite as an activity that fuels interest and understanding of the scientific process and deepens their connection to the natural world. The Academy believes strongly that by actively engaging people of all ages in the scientific process, it is possible to simultaneously conduct critical research, document biodiversity, inform management and conservation policy, connect people to nature all around them, and build a community of scientifically literate stewards.